The Latin phrases De mortuis nihil nisi bonum ("Of the dead, nothing unless good") and De mortuis nil nisi bene [dicendum] ("Of the dead, nothing [spoken] unless well (truthfully)") indicate that it is socially inappropriate to speak ill of the dead. As a mortuary aphorism, De mortuis. . . . derives from the Latin sentence De mortuis nil nisi bonum dicendum est ("Of the dead nothing but good is to be said"), which also is abbreviated as Nil nisi bonum. Freer translations into English are often used as aphorisms, these include: "Speak no ill of the dead", "Of the dead, speak no evil", and "Do not speak ill of the dead". The first recorded use of the phrase of mortuary respect dates from the 4th century, published in the Lives and Opinions of Eminent Philosophers (ca. AD 300), Book 1, Chapter 70, by Diogenes Laërtius, wherein the Greek aphorism τὸν τεθνηκóτα μὴ κακολογεῖν (“Don’t badmouth a dead man”) is attributed to Chilon of Sparta (ca. 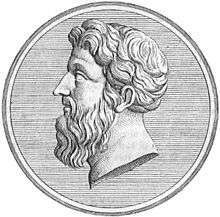 600 BC), one of the Seven Sages of Greece. In the 15th century, during the Italian Renaissance, the humanist monk Ambrogio Traversari translated Diogenes’s Greek book into Latin, as Laertii Diogenis vitae et sententiae eorum qui in philosophia probati fuerunt (1433), and so popularized De mortuis nihil nisi bonum, the Latin aphorism advising respect for the dead. After the sudden death of the Bishop's wife, the Archdeacon describes De mortuis as a proverb "founded in humbug" that only need be followed in public and is unable to bring himself to adopt "the namby-pamby every-day decency of speaking well of one of whom he had ever thought ill."
After destroying the villain, Andrew Lumley, the hero, Sir Edward Leithen, speaks De mortuis & c., an abbreviated version of the phrase, about the dead Lumley. Roger considers De Mortuis Nil Nisi Bonum as a possible inscription on the gravestone for Bock, his dog that died in an explosion. The next day, Professor Ormsby defenestrates himself from his rooms at Cambridge University, and Commander Stevenson returns to his life on the River Dart. About the dead man, two characters speak; the first asks: “What sort of chap was Dean?” . . . Hearing steps on the path, and seeing a dismal little procession passing the window: a sergeant of police and another uniformed man, carrying a stretcher between them . . . Mr. Puffett glanced from the window and removed his bowler hat: “And where’s all ’is cheeseparin’ brought ’im now?” he demanded. Player Piano (1952), by Kurt Vonnegut. An engineer, Dr. Paul Proteus, recalls the phrase de mortuis in relation to fellow workers who committed a social faux pas during the annual social gathering; they would not be invited for the next year’s gathering. Father Handy thinks of the phrase in reference to millions of people killed by nerve gas. He then subverts the phrase to "de mortuis nil nisi malum" in blaming them for complacently voting in the politicians responsible. “De Mortuis” (1942), by John Collier. After an unwitting cuckold is accidentally informed of his wife’s infidelities, he plans an opportunistic revenge; the titular phrase, de mortuis, implies the murderous ending of the story. The mortuary phrase sums up and describes the feelings of other characters about the dead man, who was a university student–inventor who evoked mixed feelings towards himself. The short story “Silence, Please” is included to the collection Tales from the White Hart (1957). After the demise of his friend/project - EPICAC, the supercomputer, the protagonist states the phrase in a memoir of someone who has done great for him. The bush poet and balladeer Adam Lindsay Gordon, Melbourne. In “Sunlight on the Sea” (The Philosophy of a Feast), by Adam Lindsay Gordon, the mortuary phrase is the penultimate line of the eighth, and final, stanza of the poem. I speak in riddles. Is it so? De mortuis, nisi bonum, nil! The lights are growing dim. The poem, “Sunlight on the Sea” (The Philosophy of a Feast), is in the collection, Sea Spray and Smoke Drift (1876). In “The Open Grave”, by Louise Elisabeth Glück, the mortuary phrase is repeated as a framing cadence. at the edge of a grave. I became an old woman. I used so to fear. The poem, “The Open Grave”, is in the collection, Vita Nova (1999). In Thoughts for the Times on War and Death (1915), Sigmund Freud denounced the cultural stupidity that was the First World War (1914–18); yet, in the essay “Our Attitude Towards Death”, recognised the humanity of the participants, and the respect owed them in the mortuary phrase De mortuis nil nisi bene. We assume a special attitude towards the dead, something almost like admiration for one who has accomplished a very difficult feat. We suspend criticism of him, overlooking whatever wrongs he may have done, and issue the command, De mortuis nil nisi bene: we act as if we were justified in singing his praises at the funeral oration, and inscribe only what is to his advantage on the tombstone. This consideration for the dead, which he really no longer needs, is more important to us than the truth, and, to most of us, certainly, it is more important than consideration for the living. The phrase is cautiously used at the funeral of T. E. Lawrence, officiated at St Paul's Cathedral; two men, a clergyman and a soldier, Colonel Brighton, are observing a bust of the dead “Lawrence of Arabia”, and commune in silent mourning. Colonel Brighton’s reply is a pregnant silence. 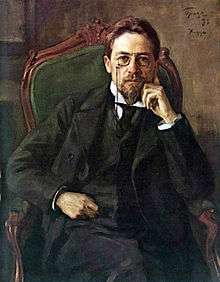 In The Seagull (1896), by Anton Chekhov, a character mangles the mortuary phrase. In Act 1, in an effort at light metaphor, the bourgeois character Ilya Afanasyevich Shamrayev, misquotes the Latin phrase Nil nisi bonum and conflates it with the maxim De gustibus non est disputandum (“About taste there is no disputing”), which results in the mixed mortuary opinion: De gustibus aut bene, aut nihil (“Let nothing be said of taste, but what is good”). "The evil that men do lives after them; The good is oft interred with their bones..."
↑ Traversari, Ambrogio (1432). Benedictus Brognolus, ed. Laertii Diogenis vitae et sententiae eorvm qvi in philosophia probati fvervnt (in Latin). Venice: Impressum Venetiis per Nicolaum Ienson gallicum. Retrieved 12 May 2013. ↑ Morley, Christopher (1919). The Haunted Bookshop. New York: Grosset & Dunlap. 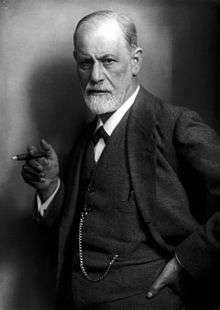 ↑ Freud, Sigmund. "Our Attitude Towards Death". Thoughts for the Times on War and Death. Bartleby.com. Retrieved 24 April 2013. ↑ Chekhov, Anton; Stephen Mulrine, Translator (1997). The Seagull. London: Nick Hern Books Ltd. pp. Introduction, p. xvii. ISBN 1-85459-193-2. ↑ Shakespeare, William. Julius Caesar.